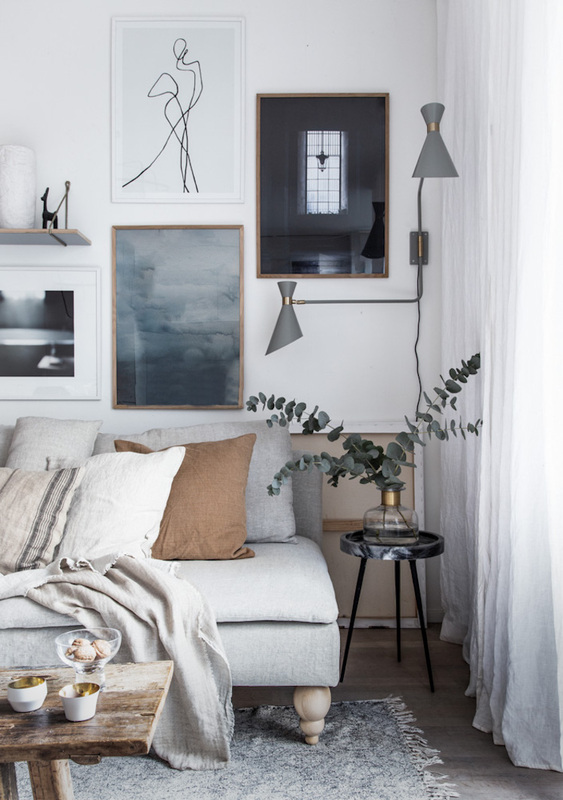 my scandinavian home: 7 Gallery Walls For Every Room - And A Fail-Safe Way To Hang Art! 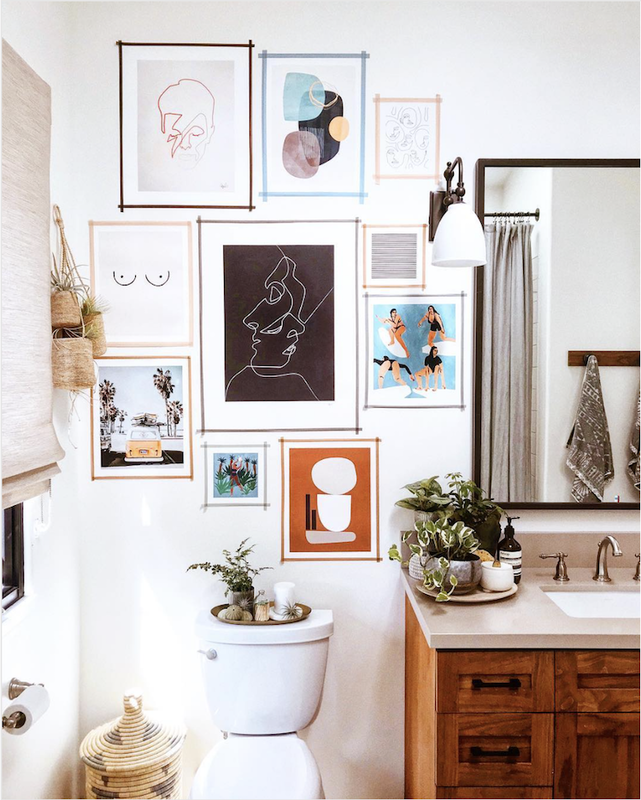 7 Gallery Walls For Every Room - And A Fail-Safe Way To Hang Art! The Danes are masters of gallery walls. The one below has been circulating the web for a while now, but I'll never tire of it! 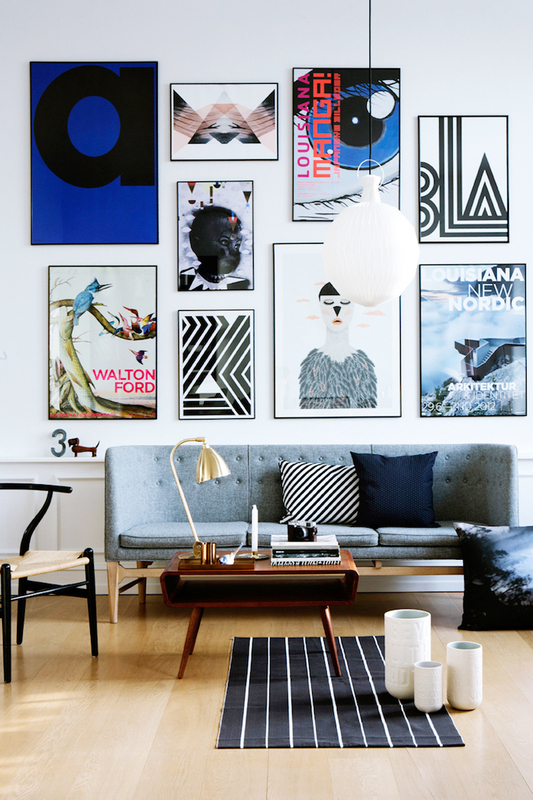 Made up of exhibition posters from Louisiana Museum of Modern Art as well as pieces by other Danish artists, it adds a whole load of personality to the sitting room! 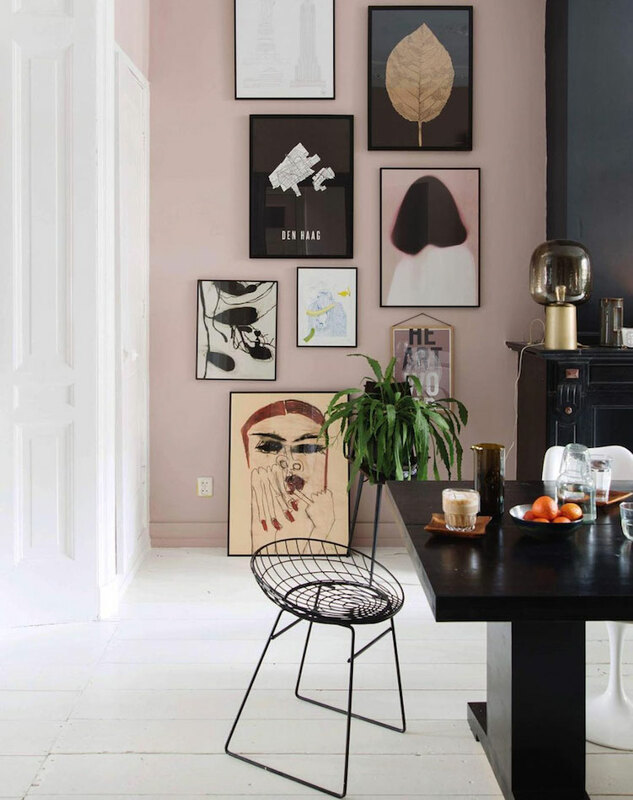 A selection of prints (including Portrait J*) trail all the way from the ground up in Theo-bert Pot's dining room against a millennial pink backdrop. See the rest of Theo-bert's creative home here! 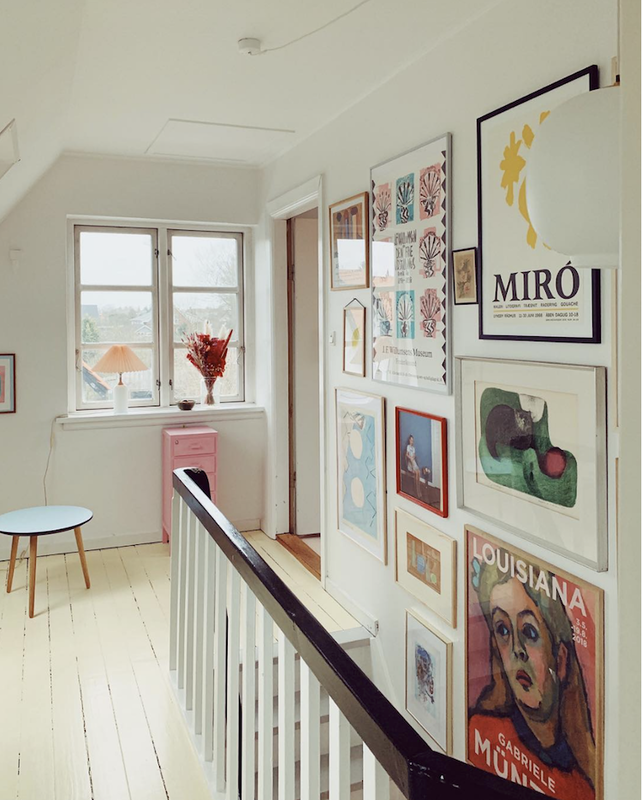 The stairs is an ideal space for art and photography. 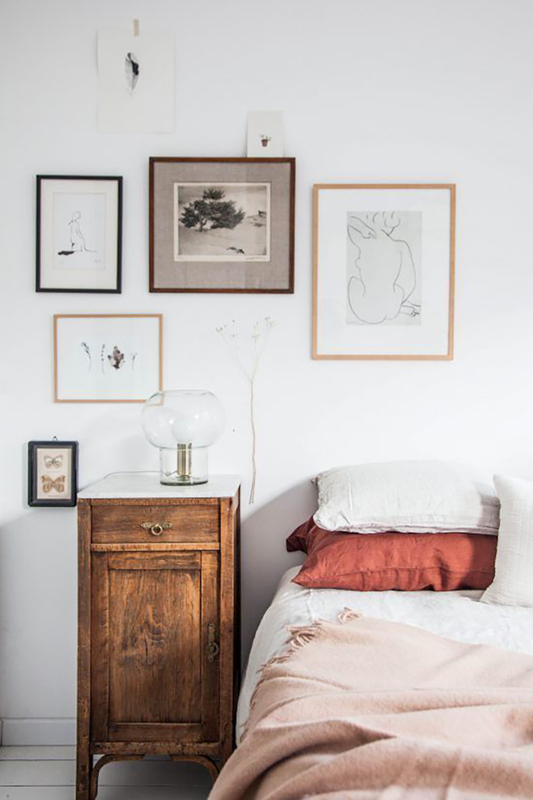 In Louise's home, a gallery wall adds a wonderful splash of colour to an otherwise white space. Think about mixing up a series of thin frames* to add interest. FYI - Louise's homes is one of my favourites! Hop over to take the full tour! 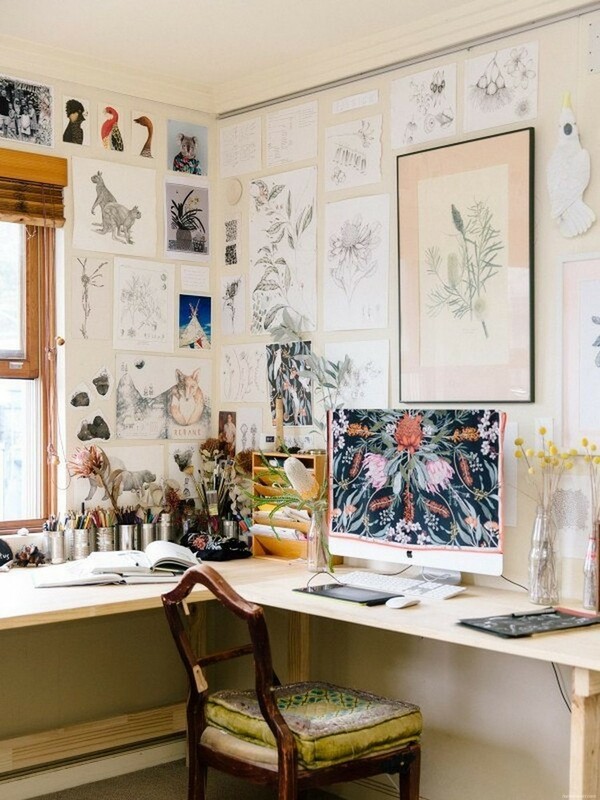 In this creative studio, artist Edith Rewa's own pretty illustrations have been combined with other work for an entire wall of inspiration. Not an artist? You can always collect pictures you love from magazines, cards and other places and create a giant moodboard! What to do with a long, narrow entrance way without eating into the space? 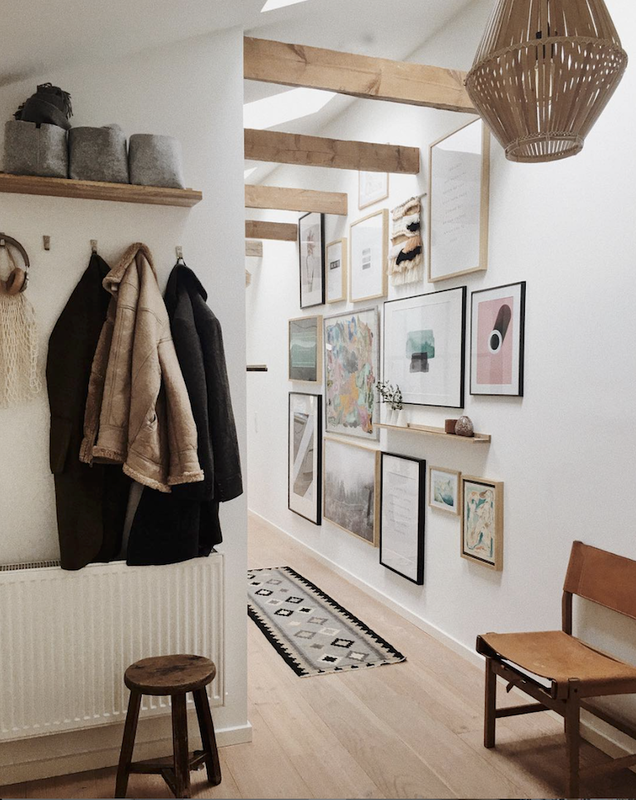 Add a gallery wall like Johanna Landbo's to brighten up your entry and exit each day (don't miss the full tour of her Danish home along with a few small space hacks here). 2. Stick them on the wall with blu-tac - and play around with the templates until you have a composition you're happy with. Quick tip I learned: artwork looks best if it's around two thirds of the width of the furniture beneath it (of course rules are there to be broken and this is definitely not an instruction - more a guide if you're feeling stuck!). 6. Tear away the template leaving the nail in place and you're ready to rock! I'd love to hear your thoughts on gallery walls. Do you have a favourite from the above round-up? Do you have one in your own home? A mix is always great, it makes a wall so interesting! I am torn. I like to rest my eyes upon artwork and let the artwork really stand out, several together like this makes them all just blend into one another and makes the wall too busy for my taste. But on the other hand, they are very decorative and a nice way to display more pictures, for instance. I am planning a gallery wall in the stairway, I find that I like them more in spaces you just pass through. I definitely agree Rita, there are some pieces that should stand alone - especially beautiful, original paintings etc. I love that tip for hanging a gallery. Never thought of just pulling away the template paper! I find it so useful! It makes the whole process a lot easier (and less scary to drill / hammer into the walls! ).